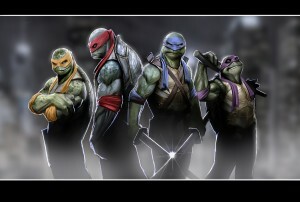 With the upcoming Ninja Turtles film mired in controversy after producer Michael Bay (director/producer for the Transformers film series) was quoted as saying the stars of the popular franchise were going to be aliens and may not even be teenagers, dropping both terms from the film title of the original Teenage Mutant Ninja Turtles title, we will examine some of the origins of the franchise and its Science Fiction ties. An unnamed young child was carrying his newly purchased four baby turtles from a pet shop when a truck comes out of nowhere, some sort of green radioactive ooze spills as the boy carrying the turtles drops them, the little creatures bathed in a pool of the ooze in the sewer below. The pet rat of a ninja, whose master was slain leaving the creature to roam the sewers of New York City, happens upon the turtles and the ooze, saving them but became covered in the substance himself. 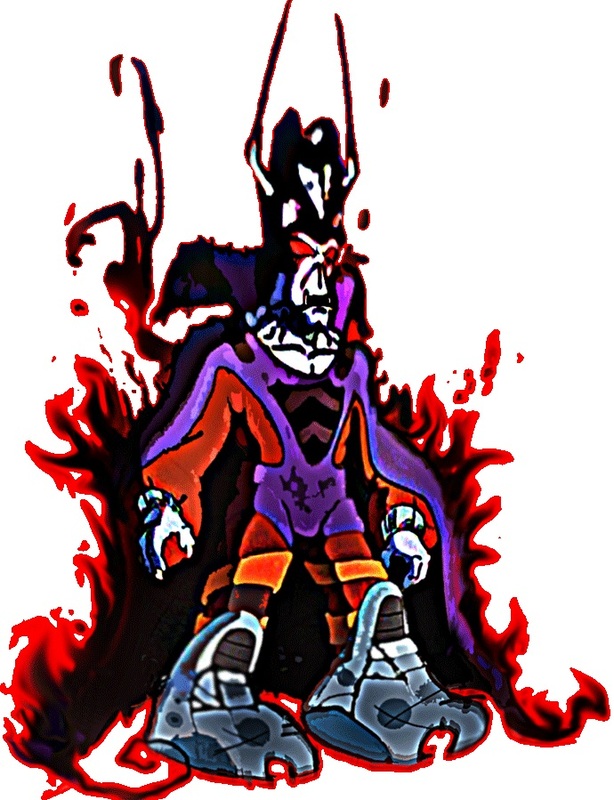 This rat, Splinter, and the four turtles mutated into a humanoid hybrid of their original species with accompanying intelligence of human beings. 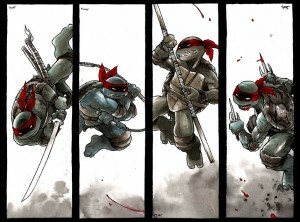 Raising the turtles as his sons, Splinter passed down the ninjutsu techniques he emulated from his owner and named the youths after his favorite Renaissance artists: Leonardo, Raphael, Michelangelo, and Donatello. Each youth developed individual personalities, Leonardo as the leader, good son, and perfectionist, Raphael as the loner, rebel, and hot head, Michelangelo as the party animal, comic book/cartoon geek, and immature trickster, and Donatello as the technology nerd and science genius. In addition to their ninja training, the youths spent their time learning about humanity from film and television and took up extreme sports as their passion. Around the time the turtles turned fifteen, they became involved with laboratory assistant (or reporter) April O’Neil and battled the Shredder, the ninja who killed Splinter’s master, and his clan of ninja, the Foot. Their story, which began as a comic book that parodied many concepts at the time (the origin with several nods to Daredevil, including the radioactive chemical spill, training under a ninja master named after lumber, and fighting a ninja clan named after a human appendage), has been adapted into toys, television, film, and video games that’s been in pop culture for almost three decades. The initial origin of the Ninja Turtles has the canister that spilled the radioactive ooze, or mutagen, on the turtles came from Techno Cosmic Research Institute (T.C.R.I. ), an Earth front for the alien Utroms. These beings appear as pink blobs (or like brains) with tentacles and were stranded on Earth (donning humanoid robots as a means of transportation and to blend in on Earth), the mutagen actually being salvaged material from their space craft. When adapted to television and film, this origin was largely dropped until the later 2003 animated series. However, introduced in the 1987 animated series was Krang, ruler of Dimension X, who bore the appearance of a Utrom including employing a humanoid robot body (the 2003 series combining the Utroms, Krang, and Shredder into a single entity). Dimension X was, obviously, a dimension separate from the one Earth occupies with a harsh environment. Though run by Krang, his Rock Soldiers/Warriors under General Traag and Granitor in his massive mobile headquarters the Technodrome enforced his will on inhabitants, including the peaceful 1950’s Americana emulating Neutrinos. One of Krang’s acquaintances/rivals in Dimension X is Maligna, Queen of the insect-like Malignoids, who seeks out green planets to turn into hive worlds (using her generals Scul & Bean as scouts). The mysterious Mr. Null helped facilitate an invasion by Maligna on Earth that became one of the Turtles greatest conflicts (Null would also be behind the emergence of the Four Horsemen and Gang of Four). Opposing tyranny from Dimension X is the ethereal (and extremely powerful) Cherubae who helped organize forces against its conquerors. 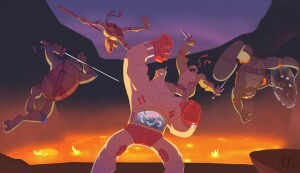 The Intergalactic Wrestling Federation (IWF) operated by Stump and Sling on the Stump Asteroid in Dimension X uses Cudley the Cowlick to bring the greatest warriors from all over the universe and dimensions, including the Turtles, to battle it out for the entertainment of an audience covering the same range. These warriors include Bloodbath, Trap, Cryin’ Houn’, Wingnut and Screwloose, Leatherhead, and Ace Duck. Members of IWF would help fend off the forces of Krang and Maligna until Cherubae could use the mighty Turnstone to end the battle. In the upcoming Teenage Mutant Ninja Turtles animated series coming later this year, the alien race known as the Kraang will be introduced combining the Utrom and Krang. Mutagen would play an important role in the Ninja Turtles series, giving rise to characters like Bebop, Rocksteady, Leatherhead (though, in the Archie Comics version, he was transformed by Mary Bones/Cherubae), Punk Frogs, Slash, Mondo Gecko, Man Ray (Ray Fillet), Scumbug, and Wyrm. In the 1987 series, scientist Baxter Stockman (designer of the Mouser units) was mutated with a fly in a disintegrator on the Technodrome (the original comic book Stockman became affiliated with Utrom Shredder in the 2003 series). Ace Duck was conceived as a test pilot merged with a duck due to a transporter beam that passed through both fired by Krang. 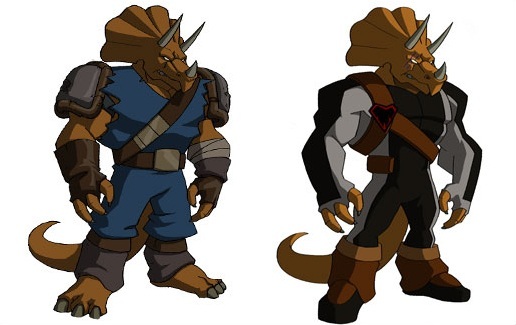 A warrior alien race that appear as triceratops humanoids whose home planet was destroyed and moved to neighboring worlds and asteroids for an empire spanning across the stars. 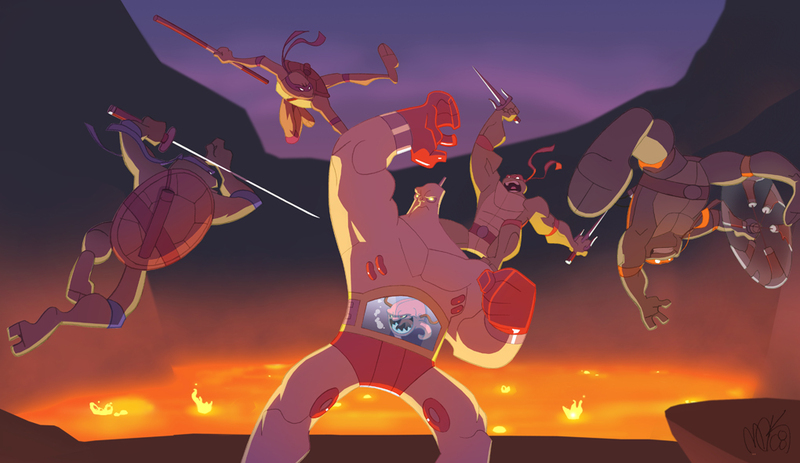 The Ninja Turtles became involved with the race when they were transported to their empire and where they competed in their combat-based tournament, bringing several of them back unintentionally when they transported back home. The Triceraton forces would be seen infrequently when the Turtles would venture into space before following the energy signature left by the Turtles back to Earth with the intent of invasion. 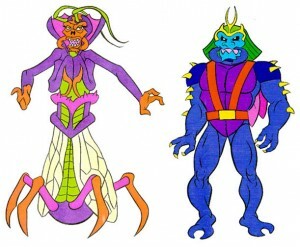 The aliens would emerge in virtually every adaptation of the Ninja Turtles save film (having actually predated the creation of the Ninja Turtles). One of the Turtles’ allies Professor Honeycutt, the Fugitoid, is closely linked to this race. Hailing from the planet D’Hoonib, at war with the Triceratons, Honeycutt was a scientist tasked with developing technology to combat his world’s enemy but accidentally merged his mind with his worker robot Sal to become the Fugitoid. As he was pursued by his own government, the Turtles teleported in and became tied in with his escape where they became friends. Fugitoid ended up becoming involved with the Utroms. 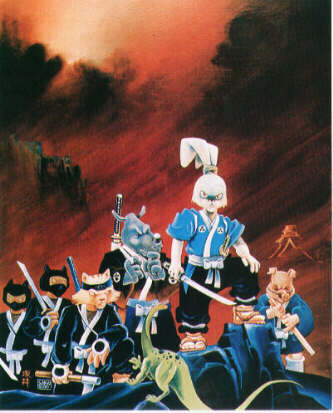 Hailing from an unspecified world that mirror’s Earth Edo Period in Japan but with anthropomorphic animals in place of humans, Miyamoto Usagi is a ronin, or masterless samurai, based on Miyamoto Musashi (touted as history’s greatest swordsman) that travels his country after the death of his master Lord Mifune. Sometimes working as a yojimbo (bodyguard), a bounty hunter alongside his friend Murakami Gennosuke, or just righting wrongs, Usagi has crossed paths with the Ninja Turtles on several occasions across several media platforms. 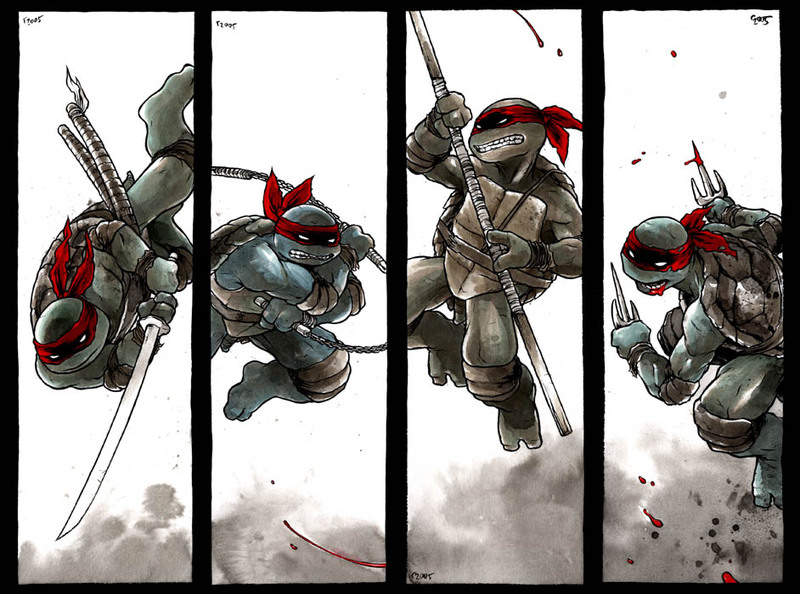 In this instances, he becomes very good friends with Leonardo and greatly revers Splinter. Created and owned by Stan Sakai, Usagi and his world are properties licensed by the creator as part of the Ninja Turtle universe. 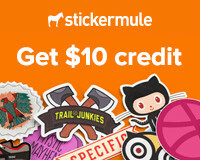 While Usagi Yojimbo is the most renowned of this phenomenon for the franchise, the same deal has been extended to other properties including Panda Khan (an otherworldly samurai from the future), Cerebus the Aardvark (which partially inspired the creators of TMNT), and the Flaming Carrot. Hailing from parts unknown, Lord Dregg roamed the universe on his spaceship Dreggnaut with his second-in-command HiTech and his alien soldiers the TechnoGangsters seeking worlds to conquer. In finding Earth and the Teenage Mutant Ninja Turtles, Dregg found his advances pushed back. Even drafting new soldiers in the Batmen aliens and his new second-in-command Mung proved too little to defeat the heroes. 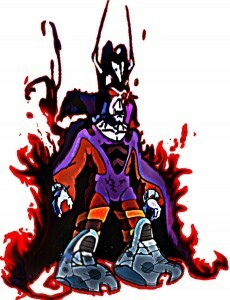 Dregg would also team with Shredder and Krang, but like them, would eventually be banished to Dimension X.